So far, we've been doing well with our NYE Resolution to brush Paddy's teeth at least three times a week. While we've been liking the Arm & Hammer Pet Dental Wipes we reviewed previously, we get the sense they're best for in-between more thorough cleanings. To get to the teeth in the back of Paddy's mouth, you also have to stick your finger pretty far back, which is neither a pleasant a experience for me or her. Fortunately, the folks at PetSmile sent us a sample of their Professional Pet Toothpaste and Pet Toothpaste Applicators to test out and we loved them both! So, how does PetSmile's toothpaste work? It contains Calprox, which helps to remove the thin laye rod protein buildup on your pet's teeth onto which stains and bacteria adhere. Removing said bacteria helps to keep your pup's mouth bacteria free, leaving it smelling fresher, looking cleaner and hopefully more plaque free. Paddy really liked the flavor of this toothpaste (beef), which made it a lot easier to even start the cleaning process. The Toothbrush Applicators are also a GAME CHANGER. Not only can you really polish each tooth and get in-between the nooks and cranes of your dog's teeth, but you can also get to those hard to reach spots in the back. Using one hand to gently open her mouth, we could reach the teeth all the way in the back that hardly ever see the light of day! What's even better is the applicators are disposable, so no cleaning out/drying a toothbrush. It literally took us less than 5 minutes to do her full mouth. The PetSmile Toothbrush Applicators are sold in packs of 50 from their website for $9, while the toothpaste (4.5oz) retails for $25. 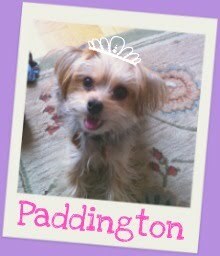 Though it's on the pricier side, if Paddy is a fan and it makes taking care of her teeth easier, we're down - especially when considering the costs associated with bad doggy dental hygiene. Disclaimer: We received samples of both of the mentioned products for the purpose of review. For more details about our review policy, please view our disclaimer. Mark & Graham Doggy "Business Bags"
Every dog owner has one. Yep. 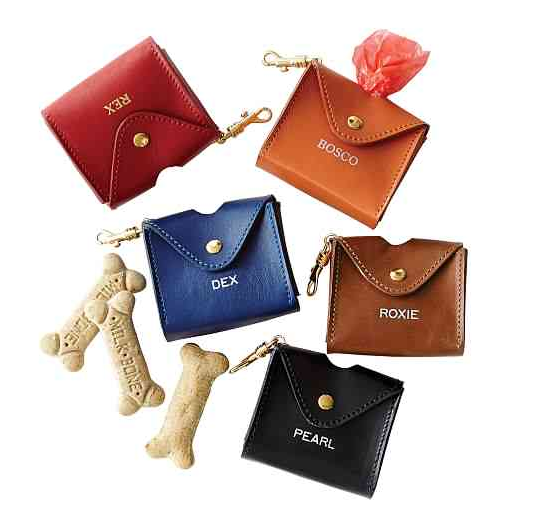 I'm talking about the iconic bone-shaped bag holder. You've probably got one hanging off of your leash, right? 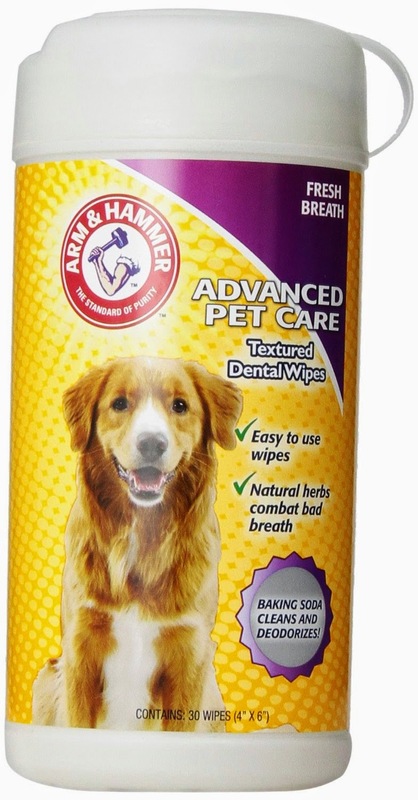 While we're lucky that Paddy pretty much will tolerate a doggy toothbrush, of late we've been loving the Arm & Hammer Dental Wipes we mentioned previously. The sheets are the perfect size for wrapping around a finger, and they're just the right size for a small mouth (it doesn't feel wasteful to use a sheet each time). That said, for bigger dogs you may need to use two. Cleaning Paddy's teeth with these disposable towels is super easy: we literally just wrap it around a finger and go to work, gently rubbing her gums and making sure to give each tooth a quick polish. 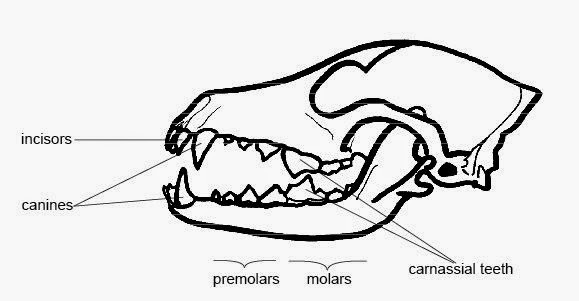 Don't forget that even though you may not see them all the time, your dog has teeth all the way in the back of their mouth too! Paddy seems to like the wipes more than the toothbrush, and they are definitely much more convenient, making it easier for us to clean her teeth every 2-3 days. She also doesn't appear to mind the taste which is a good thing! We're definitely planning on testing out some of the other oral hygiene products on the market this year, so keep your eyes on our blog for the latest and greatest for keeping your dog's smile beautiful! Hope you and your family all had a wonderful holiday season! We spent Christmas in California, which while not snowy and cozy was delightfully warm and sunny. And while there were lots of presents for Paddy under the tree.... this year's big ticket item was our Petcube (see our pre-review here)! Yes, it finally arrived! Setup was very easy. There is a quick start guide that will walk you through connecting your camera to your home wi-fi network and downloading the app on your phone. You do not need to be connected to wi-fi to access the camera through your smart phone - as long as you have data, you can load the camera. Size-wise, the camera is not too big/not too small. We have it on a bookshelf across from Paddy's bed so we can keep an eye on her when we're not at home. (Excuse the weird screenshot... but wanted to have some human legs in there for scale! It's also a little dark because the room was dark, it's not the camera.) The sound quality is pretty solid, both from the perspective of what the camera picks up and what it broadcasts. It would be nice to be able to control the speaker volume on the cube though. The laser pointer, while a cool feature, is not of much interest to Paddy, so we don't expect to use it. That said, it is cool how the laser is operated/guided by the touch screen on your smart phone. We played with it, and the laser is super responsive without much delay (at least when you're on the same wi-fi network). Ahh, a much better shot! As you can see the picture is nice and clear/crisp with good lighting. No zoom or pan, so you need to position it exactly where you want it to be. One big piece of feedback: it would be great if you could setup permissions when sharing access to your Petcube to friends/family/others. For example, while we might want to let our friends turn on the camera, we don't want them to have the ability to play with the laser or the sound. This level of granular permissions may exist, but we are hesitant to share access to our camera without knowing this first. There are some additional social network/content sharing features that we haven't checked out yet, but it looks like Petcube is trying to build a community for their users which sounds neat. Overall, we are super in love and happy with our investment! This is a completely finished product that is easy to setup/use, and does exactly what we wanted it to! The Petcube ($199) is available for purchase from their website, and it looks like they'll be rolling out some new products this spring. What are your thoughts? Do you have a pet camera?